It wasn't until I'd seen Magritte's work collected together in an exhibition at the Tate, at the end of the 1960s I think, that I realised just how incredibly funny his stuff was. People walk around these exhibitions in a religious state of awe and I just walked round this one laughing uncontrollably. 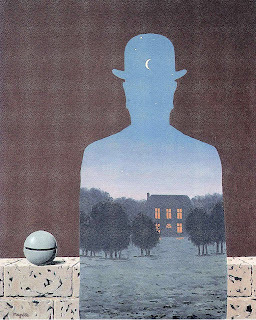 Until then, I'd always thought of Magritte as having an interesting and intriguing mind – the way he would turn things inside out or make that which was solid suddenly not solid. But suddenly here he was, this wonderfully dry joke teller. The work that really struck me that day was The Man in the Bowler Hat . 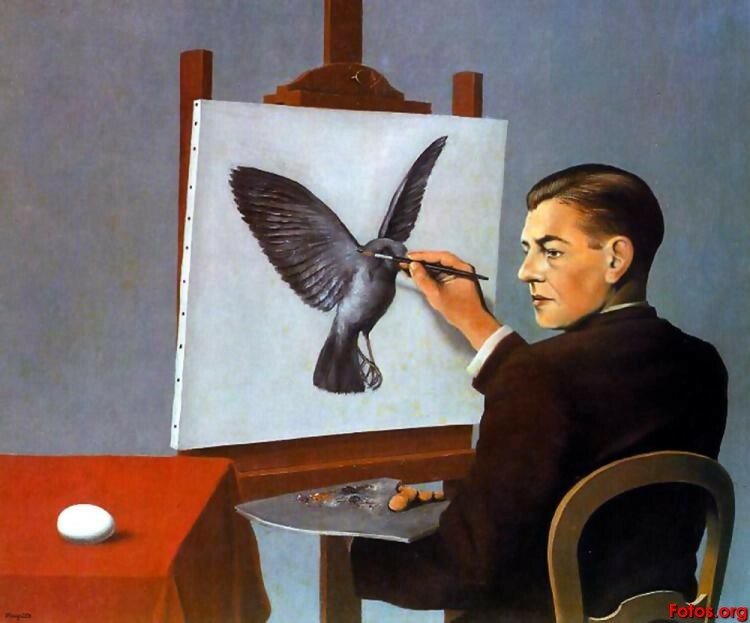 He'd spent months painting a guy in a bowler hat and then, for his last brush strokes, paints a dove flying in front of the man's face. What's happened there could happen only in a photograph and he's done a painting of it. What a comedian! I thought he was so clever. If it wasn't for the ideas I wouldn't say he was a great painter because others have a better technique. But he does what he needs to do and does it so well. 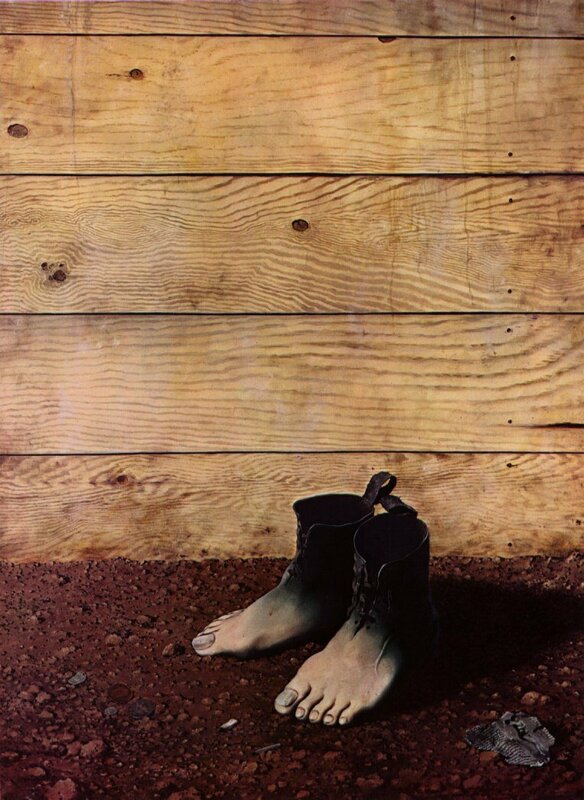 All of the surrealists got into my head, but Magritte was so direct. I liked how immediate his work was, whereas the others were more abstract. His work can be complex but in a sense he takes cliché images and puts them together in ways that surprise you. There's a night scene, but the sky is day [The Dominion of Light, 1953], there's a pair of shoes that are actually feet [The Red Model, 1934]. His work has an initial gag, but the stuff sticks with you because it's in some ways profound. He is so firmly lodged in my brain that frequently I'll see something and think, "Oh, that's a bit Magrittean". I'll look out of my window at dusk and see the house across the street catching the last bit of sunlight, except the sky behind it is already night. He captures moments of light in the day that are just odd. I used to think it was a fantasy of his, but I now find it happening all the time. Like every good artist, he makes us see the everyday differently but he does it without the pretension of so many other artists. That's another thing I like about him, that he didn't have this serious "I am an artist" approach. He went to work with a suit and a briefcase, everything about him was taking the piss out of art yet at the same time he was a wonderful artist. In my work, I can never find a direct line between what I've done and where it's come from, but I do know where the influences are and they all end up in a kind of Irish stew in my brain. I would never want to say: "I nicked that from Magritte", because that's criminal investigation time! But it would be fair to say that with the landscapes and blue skies in theImaginarium of Doctor Parnassus I could've been stealing from either Magritte or Microsoft Windows. What Microsoft did was a direct steal from Magritte! Other people paint more elaborate skies, but it's the clarity of his painting – the perfect blue sky with the perfect clouds floating in it – that's just so appealing. Were the other Pythons influenced by Magritte? No. I'm not sure what the word is for being illiterate at art. Maybe blind. That's what they were. Years ago, we were in a hotel in Munich and John [Cleese] called me and said: "I'm going over to the Pinakothek. Do you want to come and explain art to me?" So I went along and I didn't explain art to him because that's not what I do, but I did get him looking at a thermostat on the wall and discussing it in great detail. We managed to gather quite a crowd. I suppose with my work I'm always trying to get people to see what the world is capable of, to show how it can be seen in a very different way and Magritte did that all the time. When you start thinking differently like that, reality becomes a kind of game. In the 60s, people took drugs to achieve that state, but for a lot of people it was enough to go and look at a Magritte painting. Whenever I drive in any mountainous region and look at the line against the sky, I think of Magritte. And whenever I see beautiful, perfect clouds in the sky, he's the first thing that comes to mind. 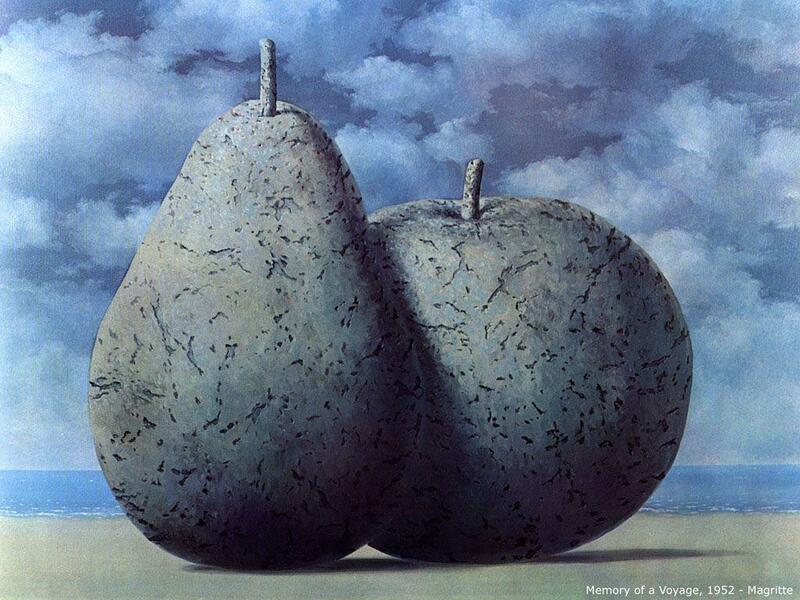 I think there is a humanity, a generosity and a kindness to others in Magritte's work. He takes the viewer into account. And I have always found the economy of his images very moving. They communicate very purely and directly. 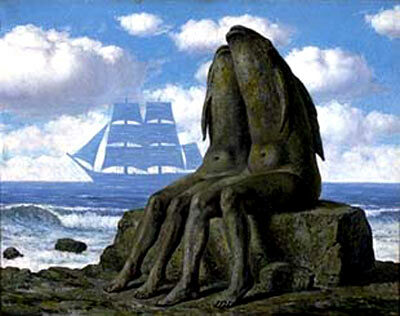 One of the most profound pieces of Magritte's is Discovery . It is an image of a woman whose flesh resembles the grain in wood. There is this aspect of Magritte which is about dealing with the world around us, and there is a certain materiality, a reality about that world that he creates, even though he makes these strange juxtapositions. 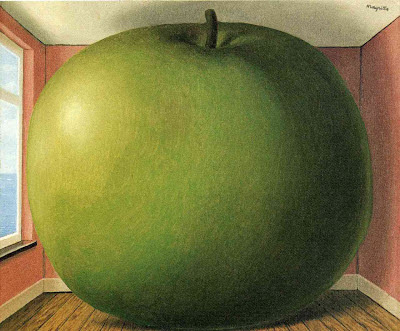 It is hard to imagine a lot of the computer programs that we work with in daily life, such as Photoshop, without the influence of Magritte. 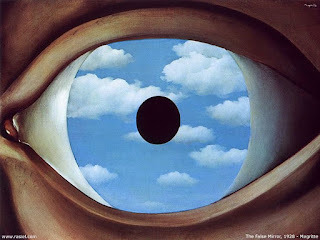 We owe to Magritte the many ways that we see the world through transparency or gradation. So I hold him in high esteem for showing us how images can be overlapped, or how they can be gradated into each other. I wouldn't say I've ever made a piece in direct response to his work, but I can see there are works that show an interest in what he was doing. Take Les Idées Claires , one of the two Magritte paintings that I have loaned to the Tate exhibition. Here, you see a rock hovering over the ocean underneath a cloud. I can associate that with one of my Equilibrium Tanksculptures of basketballs suspended in vitrines of water. 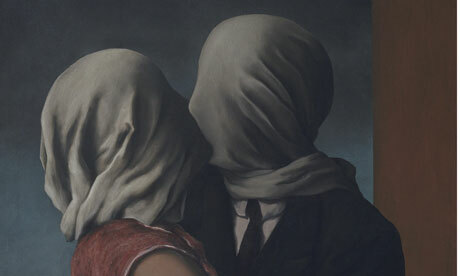 I love how Magritte's paintings initially look quite normal. He lures you in with the colours and compositions and shortly after the concept blows your mind. You think: "That's just a normal… aagh!" They're like Trojan horses. I've still got the first book I had of Magritte's work. It's stolen from the library, that's so bad! I was about 12 years old and looking at the paintings was a bit like taking drugs. They're such strong, stimulating images for a child because at that age you don't drink, you don't take drugs and you're not really interested in girls. The first painting that made me think, "Oh my god, that's something amazing" was Young Girl Eating a Bird . 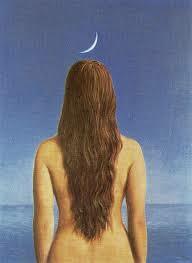 I liked how enigmatic Magritte's work was, how you didn't quite know what was going on. Surrealism and absurdity, Monty Python and Vic Reeves, they were the first things that I really buzzed off and thought, "wow, that's what I want to do". The fact that there was a surrealist movement really appealed to me too, that they met up and drank crème de menthe in weird Parisian cafes. I loved that these grown men like Breton and Magritte would really seriously discuss poems, automatic writing and painting and then put things in their magazines like a man throwing a rock at a priest. I guess it was quite punk at the time. Magritte's paintings always make me laugh. I don't care if other people say they're not funny. I find it ridiculous when you walk around a gallery and people are just looking at something obviously funny and stroking their chins. 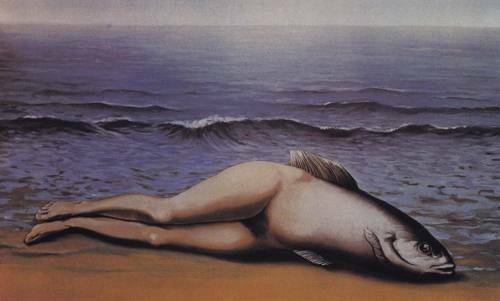 A Magritte painting such as the reverse mermaid [Collective Invention, 1934] is like a stand-up joke. Comedians do those reverse jokes all the time. When I was quite young, I did a painting of a cat phoning the fire brigade and an old lady stuck up a tree. It's the juxtaposition in the paintings that is also very stimulating. I think it was Terry Jones who said something about two disparate ideas coming together and creating a star. And that's what it's all about for me. In The Mighty Boosh, we have a character called Old Gregg who is a merman but he's also a bit like [musician] Rick James. Those two things shouldn't ever go together. But when you get it right it's perfect. Some of my own paintings are definitely influenced by Magritte. The stillness and the weirdness of Bryan Ferry with a Kite, in which Bryan Ferry has got a kite for a head, that's one of them. But he was also one of mine and Julian Barratt's joint favourites and that's apparent in the Boosh. For ages, we even wanted to have a pipe as an actual character who floated around and talked. But it was too difficult. You can see from what Julian wears that he likes the whole Magritte aesthetic – the bowler hats, the trench coats and the weird city-gent-gone-wrong look. Together, lookswise, we're like Dalí and Magritte. Dalí was more my type: flamboyant, a mad freak. My new show for E4 has even more references to art. It's set in a place that's supposed to be my house, I look like a Bollywood Elvis and my cleaner is a robotic Andy Warhol. At one point, Warhol borrows a rucksack from Magritte to go on holiday with Jackson Pollock and Keith Haring and when he turns around a train comes out of the rucksack, like the train coming out of the fireplace in Time Transfixed .I say to Warhol: "I bet that gets a bit annoying", and he responds, in his robotic voice: "No, you can get loads in there." Magritte's paintings are insane, but they're often really good one-liners so they're a great source for a surreal comedy show. When Magritte was 13, his mother committed suicide and, apparently, when the police retrieved her body from the river Sambre, Magritte was there and he saw how her face was covered by her dress. My own art and the research I do around it is all about neuroscience, how brains function, how memory functions, so this episode in Magritte's life and the way it subsequently influenced his art really intrigues me. If you look atThe Lovers , where two people have clothes over their face, I think that work specifically draws on that episode with his mother. But more generally, his work explores memory, his funny perception of reality and for me that all comes from his memory of that event. In Le Blanc-Seing, for example, which features a woman on a horse in a wood, there are almost two paintings. The way his paintings constantly shift between what is real, something he can see or saw, and something he really wants to see is what draws me into his work. 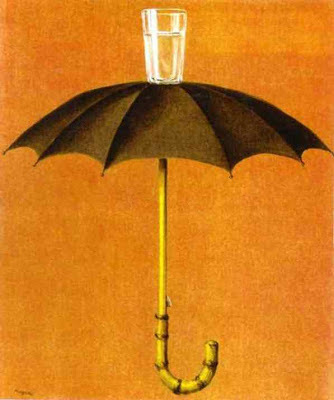 One of the great things about Magritte's work, especially The Treachery of Images (This Is Not a Pipe)  is it dismantles the idea of pictures themselves. It makes the audience consider what they're looking at and take a step back. 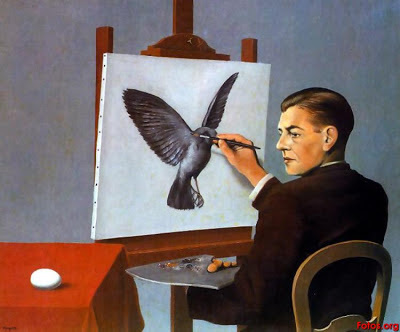 You can see that Magritte painted to experiment with his own thinking. His work is a thinking through pictures. I probably first came across the work when I was on my art foundation course and I remember my sense of relief to find that his work was immediately gettable. Some people today don't identify with the themes he's exploring or perhaps can't see past the cliché. But the way he suggestively starts to make the audience question how they see things is something that I try to include in my own art. There are two works of Magritte's which I've more or less directly appropriated in my works Oscar and Cripple. They are The Ellipsis and The Cripple , from his vache period, when he started painting more loosely, almost in a semi-expressionistic style. This period was a disaster for Magritte: the critics panned the work and the collectors ran away. But I love that he was fed up with being expected to be a certain kind of artist and was challenging his signature style. This new style almost allowed the audience in slightly closer, to get more of an insight into Magritte himself. I made two sculptures, three dimensional self-portraits, that were then reconfigured to look like these two paintings by Magritte. I was dealing with the idea of my own personal representation, my own ideas of authorship. 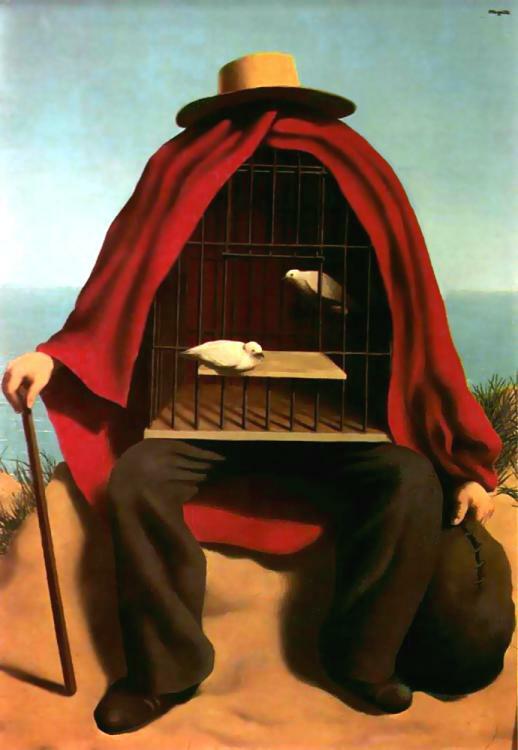 I also like the happy oddness, the sense of the uncanny in Magritte's work. In a way, there's a non-threatening but uncomfortable sensation. In an era before Photoshop, he slammed together things from different worlds and played with scale. If I were to draw parallels between his work and mine it would be that we combine disparate ideas or use this sense of the uncanny to make proposed alternatives. A work of mine like the bronze binbag sculpture is a good example – it seems straightforward, it's a shiny binbag, but then it starts to make you ask questions. It's a painted bronze sculpture, so there's this sense of permanence when actually a black plastic bag is probably a key symbol of impermanence. A Magritte work that I always return to is The Treachery of Images, because we have it at the LA County Museum. It's a kind of touchstone of his. He's affirming the slipperiness, or as he calls it the treachery, of images, of language – that a word and an object have no necessary connection other than that we collectively assigned that word and that object to go together. I really appreciate his word play. He also does a lot of the things I try to do with my work, making life a little difficult or a little challenging for the viewer who would like things to be comfortable. I think the reason Magritte has been so influential on popular culture is because he deals with images that we know – a person or a house or a street or a horse. The images aren't misshapen or distorted – he just puts them together in combinations that we don't usually think about. And in terms of advertising, Magritte and Dalí probably have been the most influential artists, so much that we don't even see it anymore. Take, for example, CBS TV's logo, the eye. I believe that comes directly from him [from the work The False Mirror, 1928]. He's everywhere. In the theatre you try and create a sense of mystery. You're raising questions, putting ordinary situations in front of people and shining new light on them. Magritte does that in his paintings, using objects that you know really well. When I directed Twelfth Night, there was a moment in my production where Viola, disguised as a boy, looks in the mirror and sees herself for the first time as a man. That's always made me think ofThe False Mirror. Both of those things are about seeing something you've never seen before in a reflection of something familiar. I had a picture of The Human Condition  on my wall when I was a teenager which I'd cut out of a magazine because it looked interesting. My favourite now is The Treachery of Images. That's about not boiling things down to their lowest common denominator or about looking beyond what you think something is. The pipe expresses that idea in its simplest form. Of course it's not a pipe! Try and smoke it! When you're working on a play, you're constantly trying not to make assumptions. As soon as you make assumptions, you stop investigating – what a story might mean, what the possibilities are within a scene. Go back to Greek drama, where the principle is that the opposite is always true, that raises as many questions as it answers. Shakespeare also challenges your expectations of people's behaviour in all sorts of ways. That's why his plays are constantly intriguing to watch. And in essence that's what Magritte does, too. When I first became interested in art, at the age of 13 or 14, I was drawn to the otherness of art, the peculiarity and anarchy of it. For me, Magritte really represented that. Then, when I went to art school in the late 80s, I realised that his paintings were not very good, technically speaking. His work seemed a bit kitsch. But later I became interested in them again, as a vehicle for ideas. I've always loved the simplicity of his work and I think it becomes more profound the more you consider it. In Magritte's oeuvre there are quite a few odd paintings that are jarring. One of my favourites is Young Girl Eating a Bird, an image of a girl eating a bird in front of a tree full of exotic-looking birds. As soon as I saw it, I thought, that's a really strange, perverse picture, whereas a lot of the others seem quite sanitised. Growing up in provincial England, I lived a long way from London so my introduction to contemporary art was through Thames and Hudson books. Magritte is illustrative in style, so you can get it without necessarily having to see the physical object of the painting, because you're still invited to think about the idea.